Jared Unzipped: The Origin of the Hook Man Urban Legend. A young couple are making out at a lover's lane, which is a secluded spot where people park for intimate encounters. They turn on the radio and hear a report about an escaped killer from a local mental institution. This killer uses a hook to murder his victims, which replaces one of his missing hands. The girl feels uneasy and asks to go home. The boy instead wants to stay and continue their frisky behavior. Finally, the girl demands to leave for their own safety, to which the boy angrily agrees. He suddenly speeds away from the lover's lane. Upon arriving at the girl's home to drop her off, they discover a bloody hook hanging from one of the car's door handles. Multiple variations of this tale have been told around campfires and at Halloween parties for decades. Yet, I got to thinking. Where did this urban legend actually come from? Is it based on an actual event? Turns out, the Hook Man is real... sort of. The tale has circulated since at least the mid 1950's. Since then, the story has grown and been drastically inflated to make it seem extra frightening. In reality, there have indeed been many incidents where couples making out at lover's lanes were murdered. The first series of widely reported lover's lane murders are the Texarkana Moonlight Murders. They took place during the late winter and early spring of 1946 in Texarkana, a moderate size city which rests on the border between Texas and Arkansas. Throughout the ordeal, a total of eight people were attacked by a murderer referred to by the media as the Phantom Killer. Of the eight, five were murdered by the Phantom. The killer has never been identified and probably passed away without anyone knowing what he or she did. The Texarkana Moonlight Murders drew national attention at the time. Nearly every newspaper and radio news service in the United States spread the details about the murders. The killer had a clear modus operandi. They would only attack very late at night on lover's lanes or in secluded make-out spots, typically three weeks apart. A .32 pistol was used in all but one of the murders. In the decade after the Moonlight Murders, the Hook Man story started to crop up. Most literary and social experts credit the Hook Man as a cautionary tale initiated by parents whom wanted to encourage their children to abstain from sexual activity. Essentially, if adults could scare their kids into believing a story about a violent serial killer attacking people on lover's lane, they'd avoid such a scenario. 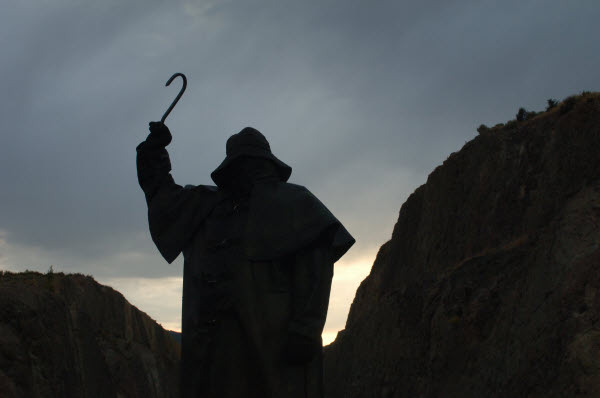 As the story entered the public consciousness, teenagers then told it to each other and expanded upon the narrative -- the legend of the Hook Man was born! The urban legend would grow and evolve from one group of people to the next, much like a spreading virus. As the years progressed, other similar murders helped stoke the proverbial fire. Examples include the unsolved 1990 Houston Lover's Lane murders and the notorious Zodiac Killer. So there you have it! The Hook Man urban legend still lives to this day. Though, considering what I learned in my research, the premise isn't so far fetched. Maybe taking your favorite guy or gal to a secluded moonlit spot and making out isn't such a great idea after all!